Close Quarters often times feels like a confessional presented in the form of fiction. A confession of what the author, Larry Heinemann, either did himself or witnessed his comrades do while serving his tour of duty in Vietnam. Or both. The story almost moves from scene to scene like a documentary. Although the beginning felt rushed to me, as there was no harassing of the "New F#@cking Guy"--our protagonist and narrator--the rest of the novel has a brutal reality feel to it that is both shocking and sobering. I found it very difficult to read sometimes. 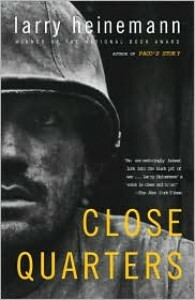 Very memorable and highly recommended if you're interested in learning about the mindset of a soldier at war.